EdwardsFamily is a Legacy Library. Legacy libraries are the personal libraries of famous readers, entered by LibraryThing members from the Legacy Libraries group. » Edwards Family's legacy profile. EdwardsFamily is also an author. About meThis collection contains books belonging to the descendants of Jonathan Edwards (1701-1758), whose personal collection is cataloged separately. There is some slight overlap between titles for books which are known to have passed down through the family. Jonathan Edwards the Younger (25 May 1745 - 1 August 1801), a minister, theologian, linguist, and college president. 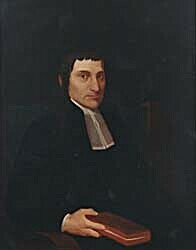 Edwards graduated from the College of New Jersey (now Princeton) in 1765, studied theology under Rev. Joseph Bellamy, and then tutored at the College from 1767-1769. After two stints at a pastor (at New Haven, CT 1765-1795 and Colebrook, CT 1795-1799), Edwards was elected the second president of Union College in Schenectady, NY. He served in that capacity from July 1799 until his death. Edwards was known for his Reply to Chauncey, and for his work with the Mohegan language, which he published as Observations on the Language of the Muhhekaneew Indians (1787). His portrait appears on this page (Courtesy of Union College). Jonathan Walter Edwards (5 January 1772 - 3 April 1831), eldest son of Jonathan Edwards the Younger. Married Elizabeth Tryon, and with her had ten children. Graduated from Yale in 1789, later serving as a tutor there and as a lawyer in Hartford, CT.
Mary Edwards Hoyt (23 June 1773 - 7 October 1864), eldest daughter of Jonathan Edwards the Younger. Born at New Haven, CT. Married James Jauncey Hoyt (~1770-1812). Benjamin Hoyt (20 August 1811 - 7 April 1847), youngest son of Mary and James Hoyt. About my libraryThose volumes included here thus far are from the collections of Firestone Library at Princeton University and Yale University Library. More volumes will be added as they are located.